While you should at least add this film to your viewing schedule at some point, you may want to proceed with caution and have a not-so-close friend pick it up at the store for you…or maybe break-out that dusty college fake-ID if Blockbuster asks for some proof of who you are. If you are bold enough to purchase it (not recommended), make sure you pay in cash while under at least minimal disguise, such as wearing a fake mustache and dark glasses. Why, Movie Mind, do you suggest such absurdities? Only because if you want to stand a chance of remaining a free-man in the ol’ U-S-of A, you’d better keep your allegiances to this film hush-hush. The Movie Mind felt dirty after watching Shooter, a modern-day Rambo (as if we needed a modern-day version with the REAL thing making its return soon!) flick with an abundance of anti-establishment feelings on the forefront. If you watched this movie and didn’t feel like a double-agent Cold-War Commie traitor, you are probably pretty high on FBI and Secret Service watch-lists. You may have also already formed a coup and tried to overthrow a government, even if it was only your high school’s student government. Either way, you have a BIG problem with authority and think EVERY person in the entire world with any power is filthy and corrupt. Look, I have issues with the current administration as much as the next guy, but short of the controversial film, Death of a President, where they fake assassinating the sitting president, there aren’t a whole lot of other films that send such a blatant message of displeasure with a government and roadmap for a bloody solution. Marky-Mark, playing Bob Lee Swagger (three names = potential assassin in case you glossed over that hidden innuendo, Lee Harvey), is so angry at the USA for leaving him for dead in a secret “black-bag” mission that he decides to help them again years later. He does so of course because he has an unwavering love for his country and faith in its virtues. All he has to do is plot out a pseudo-assassination attempt on the president in order to weed out a real one. It’s like when casinos hire former con-men to weed out the criminals and card-counters in their establishments. Unfortunately for Swagger, Colonel Johnson (Danny Glover) has different plans for him and also happens to speak in tones so low and deep, Shaft sounds like a dog-whistle. Apparently Swagger was helping the wrong team all-along, and with his love for country finally worn out, he takes his US Government trained All-World Sniper skills and turns them on anybody who looks at him cross-eyed. Overall, the action and shoot-it-up scenes were really fun to watch. There’s something about watching a sniper blow-off someone’s hand at 500 yards that makes the hair on your arms stand up. Not to mention if it wasn’t for the fact that I’d rather not get called into the FBI field office to answer some questions, I could kind of respect the wild-west/vigilante method of government purveyed in the film. If they had just stuck to a shoot-em up blow-em-up plot instead of the writers crying out for another high-level government conspiracy theory, we may have been able to stomach it. Get a grip people, not everyone politician in the world is a real-life version of Austin Powers’ Dr. Evil and Inspector Gadget’s Dr. Claw, even if some really are dirtbags. Bob Lee Swagger: You don’t understand how serious this is. They killed my dog. 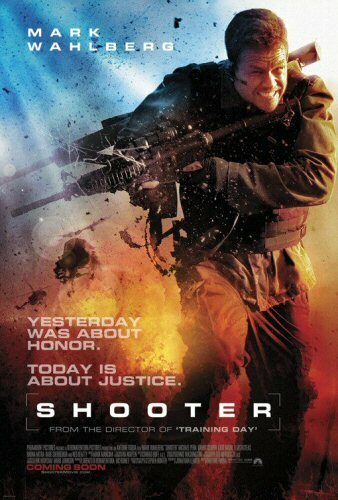 Bob Lee Swagger: Welcome to Tennessee, patron state of shootin’ stuff. Bob Lee Swagger: Where are we meeting? Colonel Isaac Johnson: Somewhere where I can see you coming from a god damned long way off. Dude, have you seen every Wahlberg movie or what?